CLICK BELOW TO SEE EXAMPLES OF MY ARTWORK! 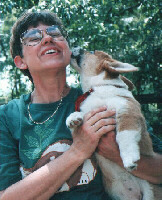 Hi, I'm Marie and I have had Pembroke Welsh Corgis since 1992, and Swedish Vallhunds since 1993. I live in a very rural area of northwest central Florida and I own a Sign Business that I run out of my home (so I can spend more time with all my dogs). Greater Gainesville Dog Fancier's Association, Inc.
Sunshine Pembroke Welsh Corgi Club, Inc.